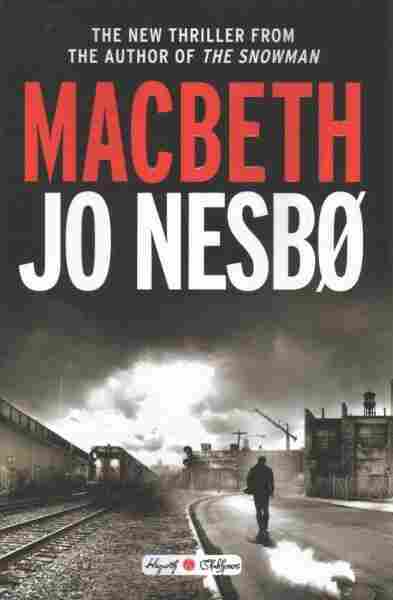 Jo Nesbo Gives 'Macbeth' A Gritty, Action-Packed Update The latest installment of the Hogarth Shakespeare series sees crime novelist Nesbo taking on the Scottish Play in an adaptation that comes alive the farther he strays from Shakespeare's original. "Macbeth" is the most recognizable of Shakespeare's plays, a sort of Elizabethan suspense thriller filled with unforgettable and almost over-the-top moments: Witches brewing, villains handwringing, ghosts walking. Small wonder the editors of The Hogarth Shakespeare, who have previously tapped Margaret Atwood for The Tempest (Hag-Seed) and Edward St. Aubyn for King Lear (Dunbar) assigned the "Scottish Play" to superstar crime novelist Jo Nesbo. Best known for his books featuring Norwegian cop Harry Hole, Nesbo hoists the flag of Scandi-noir proudly now that his fellow Henning Mankell has died. However, does that mean Nesbo has the muscles to carry the Bard's work? He places the action not at a brooding Scottish castle, but in a brooding 1970s city; we don't know that it's Scottish, but its "twenty-four-hour dope market" and "silent, dead factories" provide enough of a feel. This city is the kind of post-industrial wasteland that may force fans of "Cool Britannia" to recall the United Kingdom's difficult late-20th-century transition from a land of hope and glory to a country of drugs and the dole. Cross Trainspotting with a Val McDermid mystery and you'll have some idea of how bleak this place feels. In this nameless burg resides the corrupt SWAT-team Inspector Macbeth and his "Lady," who runs the (seedy) local casino. When Macbeth receives a prophesy from two Chinese drugmakers and their giantess companion (yes, apparently even in the hard-luck '70s, visions come through), Lady urges him to act on it and pursue becoming Chief of Police — because then she'll control that department completely. Out with the clean-cut commissioner Duncan, in with the serpentlike druglord Hecate, who resembles no one so much as Semyon in Eastern Promises: "... the great man with the soft cheeks, the friendly smile, the dark wavy hair and the cold eyes." As the action ratchets up, readers may notice that this Macbeth entertains best when it veers off from Shakespeare's plot. Nesbo does what he does very well: The crazy drug bust that goes sideways proves this (it also makes Macbeth a hero, which later will prove equally crazy). What Nesbo doesn't do very well is discern the point of Shakespeare's tragedy. There's so much action that readers will be hard put to decide what matters most, the corruption of a community, or the rotting of a relationship. Shakespeare — this will come as no surprise — had something else in mind. His play centers on the title character's inner turmoil. Power and guilt are woven into Macbeth's dilemma and choices. The plot turns on how one man treats everyone else in his world, from the basest criminals to the most powerful rulers. While Nesbo's adaptation sings when he departs from the original script, it also takes him farther from the original's core, a tragedy in which hubris takes down the protagonist. While Nesbo's adaptation sings when he departs from the original script, it also takes him farther from the original's core. Which isn't to say there isn't a lot to like. Nesbo fans won't care one bit about the un-Shakespearean aspects of his Macbeth. They'll be rapt watching Macbeth grow more and more venal, like Walter White in "Breaking Bad." This author packs his novel with action, from shootouts to chase scenes, and there's something compelling about the drive behind them, about the need these characters have to construct something greater and more interesting than the circumstances meted out to them by the universe: "The broad, majestic gently graded steps led down to the dark, deserted Workers' Square, where once there had been hustle and bustle, market stalls and travelers hurrying to and fro, but which was now ghostly, a square where the wind whistled and whined." That need recalls the way Shakespeare borrowed his Macbeth from a Scottish work called "Holinshed's Chronicles," which in turn lifted the character from Hector Boece's 1527 "Scotorum Historiae." 'Twas ever thus, that writers borrow ideas from other writers, and it's the same throughout the Hogarth series: St. Aubyn's Dunbar, for example, renames the King Lear character and pulls many aspects of that Shakespeare play over the line into farce, while Jeanette Winterson's The Gap of Time takes The Winter's Tale contemporary as well, but preserves many of its plot points. In other words, Nesbo has adhered to his contract, delivering a book that plays off of Shakespeare's work but succeeds as his own. Will readers love it or hate it? That depends on why they read it. Shakespeare buffs may want to keep the book at arm's length, while Nesbo followers will devour it in one sitting, despite the 500-page length. An earlier version of this story incorrectly said Harry Hole, the protagonist of a series of crime novels by Jo Nesbo, is Swedish. Like the author, Hole is Norwegian.